Margarete Heymann Löbenstein Marks (German, 1899–1990), Tea Service, ca. 1930. Milwaukee Art Museum, Purchase, Decorative Arts Deaccession Fund, M2011.17.1-.21. Image from Wright auction (Chicago, IL). The papers are signed and I can say it: The Milwaukee Art Museum welcomed into its permanent collection a Tea Service designed by Margarete Heymann Löbenstein Marks. After we purchased the work at auction two months ago and the wire transfer payment was complete, several of the Museum’s art preparators traveled to Chicago to pack the ceramic pieces carefully and adeptly deliver them to the Museum’s art vault. I patiently waited a few weeks for the next scheduled meeting of the Museum’s Acquisitions & Collections Committee, when I was able to share the artwork in person. In the final act of acquiring artwork for the permanent collection, the Museum’s Chief Curator, Director, and the Chair of the A&C Committee signed the paperwork that officially make the object part of the Milwaukee Art Museum. And now I can say it: Welcome to Milwaukee, Grete Marks! 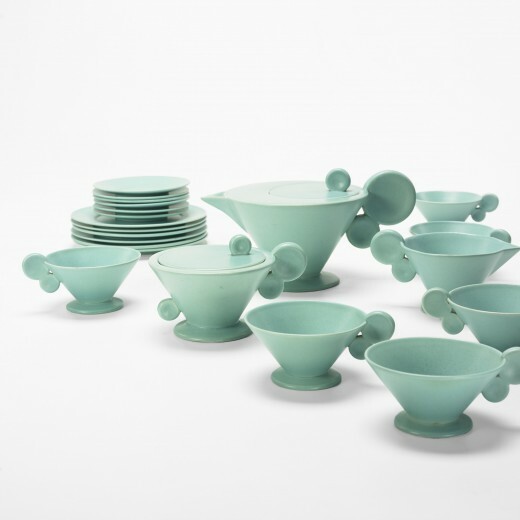 The artwork is a 21-piece tea service designed by Margarete Heymann Löbenstein Marks (or, Grete Marks) and manufactured at her German Haël Werkstätten factory sometime around 1930. Marks was trained as a ceramist at the German Bauhaus school. In 1923 she established a factory near Marwitz that both embraced forward-looking geometric abstraction, but also the careful integration of handicraft and design with material selection and the manufacturing process. I see all of this in the bold shape of her conical teapot, and the thoughtful integration of good craft with efficient production that mass-produced this design. Reviewing all components of the Grete Marks tea service. 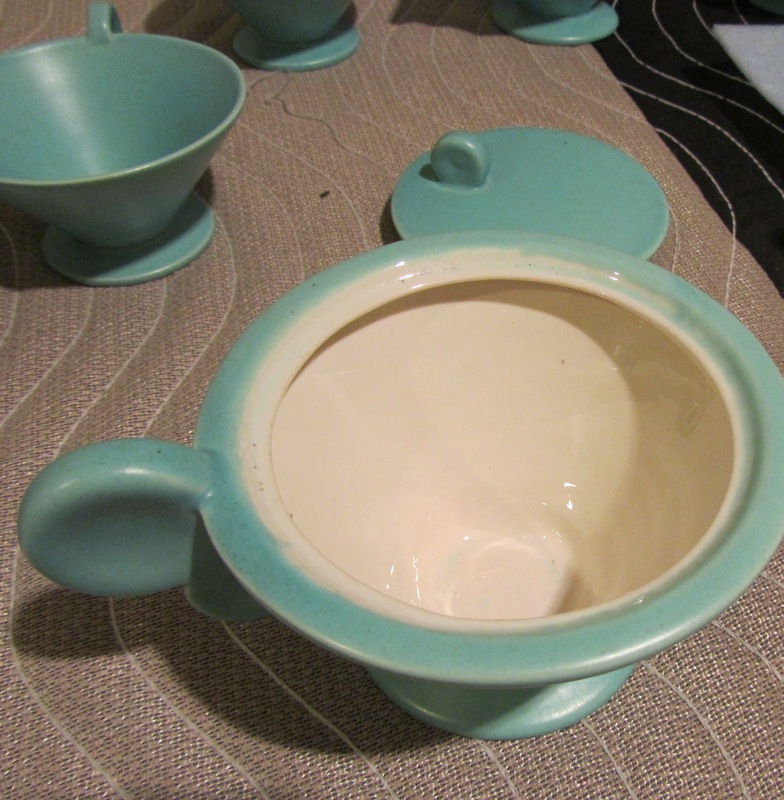 Surprise: Glossy cream glaze on the interior of the sugar bowl. Photo by the author. As a left-leaning Jewish woman running an artistically avant-garde factory in early 1930s Germany, Grete Marks caught the negative attention of the Third Reich. Her factory was forcibly overtaken in 1934 and her designs publicly derided by the Nazis as “degenerate” in Joseph Goebbels’ newspaper Der Angriff. Not only do I find Grete Marks’ work stunning, but her compelling life story witnesses the horrific squelching of Modern art under the German Nazi regime. She was a forward-looking artist and a successful business manager who was crushed from her full potential by the brutal circumstances of her political time and place. My November 2010 blog post “A Time When Modern Was Degenerate” shared the start of my research on Grete Marks, and I will be continuing this presentation of her story at the Milwaukee Art Museum. For this blog post, however, I’m detailing the steps in bringing an object in to the Museum–what we call cataloging the work. Let’s just say that from my research I already know the basic information like artist life dates and the object date, so I was at a good starting place. Examining and recording details on the Grete Marks tea service after it arrived at the Museum. Photo by the author. At the start of cataloging the artwork, each part of the 21-piece tea service will receive its own unique identification, an accession number. The registrar department assigned the number M2011.17.1-.21 for the tea service. This might seem like a mishmash of random numbers, but every bit gives us information. The “M” indicates the object is part of the Milwaukee Art Museum Collection, the “2011” is the year it entered the Collection, and the “17” means it was the 17th object to get a number this year. The next numbers indicate the pieces of the set. So M2011.17.1a,b will be the teapot and its lid, M2011.17.2a,b the sugar bowl and its lid, M2011.17.3 the creamer and so on, through .21. 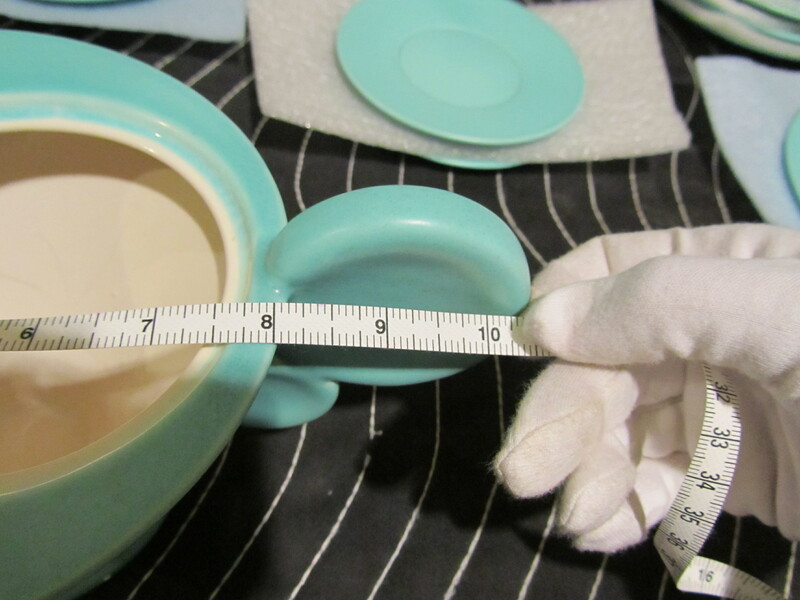 Carefully measuring all components of the Grete Marks tea service. Photo by the author. 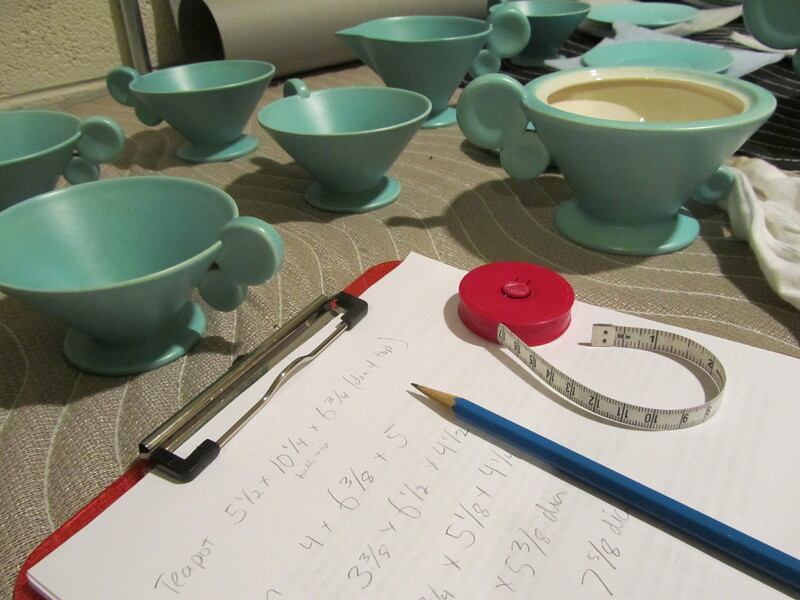 I carefully gathered measurements of every teacup, creamer, and saucer–height, width, and depth. Did you know that measurements are always recorded in that specific order? 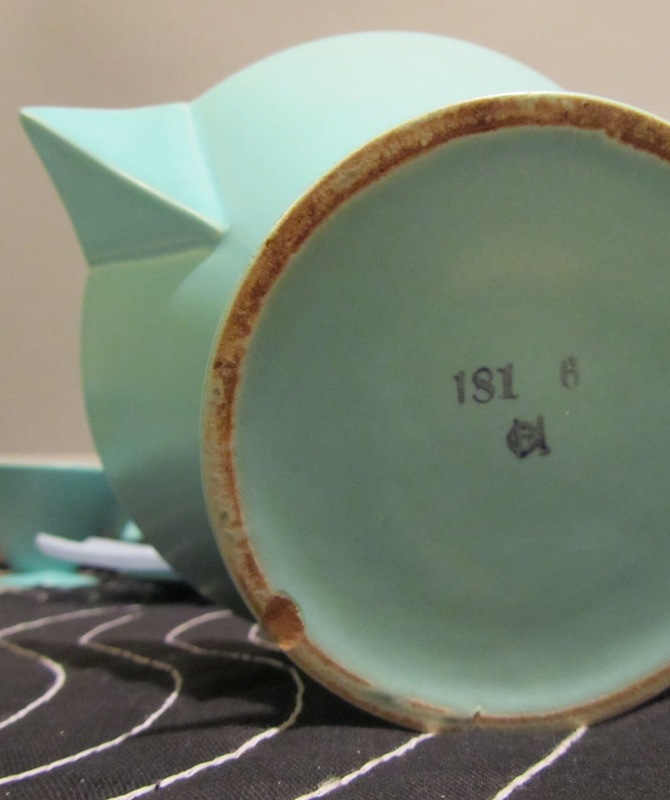 When you see an artwork–like the teapot above–listed as 5 1/2 x 10 1/4 x 6 3/4 inches, you know from the order it is 5.5″ in height, 10.25″ wide, and 6.75″ deep. I had been working as a curatorial assistant for a year when I put down an object measurement as 5 W x 6 D x H 2 inches. Colleagues laughed at me, so I’ll save you the same embarrassment. Always H x W x D! Recording the marks and stamps on all components of the Grete Marks tea service. Photo by the author. In looking (lovingly) at every piece, I carefully recorded all the stamps and markings or any signatures I might find. In this case, each object is stamped “181 6 / HL”, but I honestly can’t say I know definitively what all that means. If that intertwining smudge you see in the photo at left is “HL,” as I think it is, it would mean Grete Marks’ Haël Werkstätten factory. The word Haël came from the blended H and L names of Grete and her husband, for Heymann and Löbenstein. I don’t yet know all the codes for the factory marks (like the 181), but I plan to investigate this as part of the ongoing research. I am thrilled to have this wonderful artwork for the collection at the Milwaukee Art Museum. Behind the scenes, I’ll be working during the next year to bring together and analyze the academic details of Grete Marks’ story and her artwork, but also to coordinate the logistics needed to gather her artwork together for an exhibition. This is the final post in a four part series. Part 1 detailed the steps I took to get pre-approval to purchase artwork for the Museum at auction. Part 2 detailed a trip to the auction preview to investigate the object’s condition. Part 3 detailed bidding at auction. This entry was posted in Art, Behind the Scenes, Curatorial and tagged 20th century art, auction, Behind the Scenes, cataloging, Design, Grete Marks. Bookmark the permalink. Wow, Mel–I can see how you could fall in love with this beautiful artwork. Such an exciting series to read with a grand finale! Wonderful news Peter! If you are local to Milwaukee, or able to travel, I’d be pleased to share my “Grete Marks: When Modern Was Degenerate” exhibition that opens on September 6 2012 and runs through January 1, 2013. If you can’t make it in person, the research will be published in Chipstone Foundation’s 2013 “Ceramics in America” journal. Concerning the stamp – I guess the stamp is meant to be a G and a H, composed to one sign. I forgot to mention: G for Grete and H for Heymann.